In 1986, there was a need for a special person here on earth. God answered that need in a way no one could imagine. Twenty-one years, 36 days, 1 hour and 36 minutes later, God considered this mission complete and this special person was given a new assignment and there was one terrific angel in heaven. Our community and our family in particular were truly fortunate to have Tyler in our midst. From day one, he gave everyone that came in contact with him a reason to smile. Tyler spent his first 3 ½ weeks battling for his life in the pediatric care unit of Hartford Hospital. True to his nature, he fought hard and won that first battle. During early childhood, Tyler was dubbed “The Mayor of Marlborough” by Marlborough’s elementary school’s physical education teacher, Tony Colavechhio. His days at Marlborough’s elementary school were indeed punctuated by smiles and happiness as he was integrated into the school population because of the efforts of teachers like Jill Marocchini. During Tyler’s formative years, his athletic prowess as a Special Olympian began to blossom. He began with unified sports at the elementary school level. 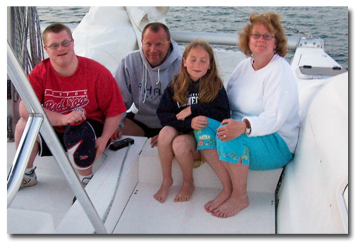 At the age of 8, Tyler joined the Glastonbury Special Olympic Program. It was there that his love of sports started to flourish. 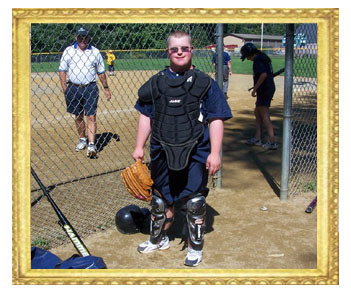 Tyler started off by playing his favorite sport, baseball, with the Manchester Challenger Division. It was also at this time that he began to follow the Boston Red Sox and soon became one of their most devoted fans. By the age of 12, Tyler not only played softball with the Special Olympics, but he also started to compete in ice hockey, basketball, swimming, and speed skating. Tyler’s athleticism and social skills continued to blossom during his two years at RHAM Middle School. This was when he was introduced to RHAM teacher and varsity basketball coach, Steve Emt. From the start, Steve and Tyler shared a very special bond. In eighth grade, Tyler began his first season as manager of the RHAM varsity basketball team. He continued as manager for the next seven years and became part of the fabric and culture of RHAM high school. It was also during this year, that RHAM middle school wrestling coach, Paul Steiner, helped Tyler compete on the wrestling team. He won three of his matches. Tyler moved on to RHAM High School and his competitive spirit grew. The Special Olympian gold medals mounted, giving Tyler a bit of a reputation as an athlete. More importantly, friendships were building and strengthening and Tyler was developing a unique leadership quality. Indeed, Tyler’s acceptance in the RHAM high school community grew daily whether it was eating lunch in the cafeteria, hanging out with his friends after school, or going out on the weekends. Tyler helped break down the barriers often encountered by people with special needs since he was always treated “like one of the guys”. This is something that made RHAM high school and the entire local community special. Awards and honors kept coming. Tyler seemingly had a permanent spot on the RHAM Honor Roll, something he took great pride in. In 2005, he was voted Senior Prom King by the RHAM student body. In 2006, Tyler received the Peter A’Coin Award from RHAM High School and the prestigious “Spirit of Life” award from the Connecticut Special Olympics. Additionally, the Marlborough/Andover Grange? honored Tyler as its “2006 Citizen of the Year”. Entering, 2007, Tyler was ready for the next chapter – adulthood. Ready, willing, and able to enter the workforce with its increased responsibilities, Tyler’s journey was cut short. Tyler touched many, many people during his short life. His passion for life, sports, school, friends, and above all, family will always be remembered. Tyler is forever gone but will never be forgotten. Money raised will be awarded as scholarships to two RHAM graduates, a Glastonbury high school graduate, and a graduate from the state of Connecticut who have volunteered as partners in Special Olympics and/or Unified Sports. These scholarships are awarded annually. Beginning this year the Fund will also make contributions to the local organizations that were so influential in Tyler's life and he was proud to be part of. This year's contribution is going to the Marlborough Elementary Special Education Dept. The annual Tyler Cormier Memorial Golf Tournament to benefit the scholarship fund will be held this year on Monday, August 12th, 2013 at Blackledge Country Club in Hebron. Follow this link for details about the golf tournament. For 21 years Tyler gave us and all that knew him reasons to smile. All the support, love and kindness that Tyler received, he gave back. He truly loved life and all the people he knew. Our family and his friends miss him beyond belief and we know our lives will never be the same, but are better for knowing and loving him. However we also know that our lives go on. The support we have received from our community has been unbelievable and been a tremendous boost. Thank you very much.